Hello! Welcome to the Stamp Review Crew Blog Hop featuring the Seaside Shore stamp set. Thanks so much for stopping by! My first project is a "window" into an aquarium. Therefore, the slight "haze" you see over the water scene is a piece of Window Sheets. The greeting sits on top of the Window Sheets. It's hard to capture in the photo, but I added Wink of Stella Clear Glitter Brush on the Very Vanilla areas of the fish and to the sea grass. I was composing this blog post in my mind as I was flying to Colorado on Friday and realized that I could have made this a Shaker Card with the addition of some of the new Iridescent Sequins OR added a few of the Iridescent Sequins on the embossed base to simulate bubbles. 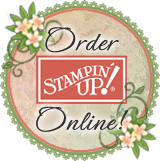 One of the people who provides a boat load of inspiration to me in my card making is Tanya Boser, the leader of the Stamp Review Crew and Stampin' Up! Artisan. The background for this card was inspired by her frequent use of stamped patterned backgrounds. These are the large starfish and large scallop shell stamped in Versamark and heat embossed with Copper Stampin' Emboss Powder. The beautiful sentiment comes from the So Many Shells stamp set. The cardstock color of the card base and mat for the sentiment are Fresh Fig, a new In Color. I think the shine from the copper embossing took overtook the color of the Fresh Fig in the photo. With the heat of Summer, the Seaside Shore stamp set certainly puts me in the mood to head to the water. If you aren't close to the shore, you may want to pull out this stamp set and get your beach on. I'll be sharing the how-to's for these projects very soon, so be sure to return to see the liners for the inside sentiment areas for each of these projects and the coordinating decorated envelopes. Be sure to visit all the stops on this week's hop to find more ideas for using the images included in the Seaside Shore stamp set for your projects. Just click on the NEXT or PREVIOUS buttons below to continue. Beautiful cards! I love the pop of Lemon Lime Twist and oh that embossing - wowza! What a gorgeous set of fishy projects. Is there anything that doesn't look awesome embossed in copper?? Beautiful cards! I have this stamp set but haven't inked it yet! Now I have two great projects to CASE! OH my goodness - love the copper embossed images! Beautiful! Beautiful -- love all the details. The copper shells are so pretty. That first card is so cool - how you made what really looks like a silver frame. I had to read closely to be sure. And I really love the different look and feel of your 2nd card - shows just how versatile this set can be. Your aquarium card is so fun! I like the idea of adding the iridescent sequins, in both ways you mention. The Seaside embossing folder is perfect in the background too. Of course, I adore the Copper on Crumb Cake embossing of the second card :) And I feel honored that you find inspiration in my work, you are mighty inspiring yourself! Oh my gosh! I LOVE the copper embossed card. It is absolutely stunning. And what a cute idea to create a scene from an aquarium...so creative!